Jack Simpson Kirkpatrick was born in 1892 at South Shields in the north east of England. He came from a large family, being one of eight children. As a child during his summer holidays he used to work as a donkey-lad on the sands of South Shields. He had a great affinity with animals, in particular donkeys. Later he deserted ship in Australia when he heard of the war with Germany. Fearing that a deserter might not be accepted into the Australian Army, he dropped Kirkpatrick from his name and enlisted simply as John Simpson. He was to become Australia’s most famous, and best-loved military hero. In Perth on 23rd August 1914, Jack was accepted and chosen as a field ambulance stretcher bearer. This job was only given to strong men so it seems that his work as a stoker in the Merchant Marine had prepared him well for his exceptional place in history. He joined the 3rd Field Ambulance at Blackboy Hill camp, 35 km east of Perth on the same day. On the 25th April 1915 he, along with the rest of the Australian and New Zealand contingent landed at the wrong beach on a piece of wild, impossible and savage terrain now known as Anzac Cove. Attack and counter attack began. 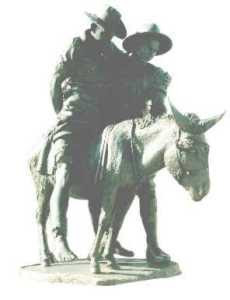 During the morning hours of April 26th , along with his fellows, Jack was carrying casualties back to the beach over his shoulder – it was then that he saw the donkey. Jack knew what he had to do. From then on he became a part of the scene at Gallipoli walking along next to his donkey, forever singing and whistling as he held on to his wounded passengers, seemingly completely fatalistic and scornful of the extreme danger. He led a charmed life from 25th April 1915 until he was hit by a machine gun bullet in his back on 19th May 1915. "Almost every digger knew about him. The question was often asked: "Has the bloke with the donk stopped one yet?" "he was the most respected and admired of all the heroes at Anzac." Captain C. Longmore, in 1933, remembered how the soldiers "watched him spellbound from the trenches... it was one of the most inspiring sights of those early Gallipoli days." Colonel John Monash wrote "Private Simpson and his little beast earned the admiration of everyone at the upper end of the valley. They worked all day and night throughout the whole period since the landing, and the help rendered to the wounded was invaluable. Simpson knew no fear and moved unconcernedly amid shrapnel and rifle fire, steadily carrying out his self imposed task day by day, and he frequently earned the applause of the personnel for his many fearless rescues of wounded men from areas subject to rifle and shrapnel fire." Jack was recommended for the Victoria Cross, officially, through his unit, on June 3rd 1915. He was also recommended for the highest military honours by Colonel (later General Sir John) Monash, Australia’s greatest commander of the First World War. Monash, commander of the 4th Brigade at the time (where Jack was operating) was an eye-witness to his activities and sent in a lengthy submission to Divisional Headquarters on May 20th.